We’ve all got dreams, big and small. No matter how much money is involved, whether it’s a little or a lot, winning can be exciting. Go out to dinner – If you and your partner have a favorite restaurant that you haven’t frequented in years, why not go there with your latest BingoMania winnings? Even the smallest treats can pay off real dividends in memories with the ones you love. Go to the spa or salon for some extra pampering – There is certainly nothing wrong with spending your winnings on a little bit of self-indulgence. Think of it as investing in yourself for a little “you” time. Booking a day at the salon or the spa is a fantastic way to spend your winnings. You can get your hair done, have a makeover, enjoy a full massage, a facial, a manicure or pedicure for example and you will feel absolutely fabulous afterward! Buy that outfit you’ve had your eye on – Along the theme of pampering, you might want to take your BingoMania winnings and splurge on that chic outfit you’ve had your eye on, for example, or get that gorgeous leather jacket that’s just your style. It feels awesome to have something new in your closet and if you bought it with your winnings, it might even make you feel lucky! Get someone you love that special thing they have been wanting – Has your partner been moaning about that 20-year-old coffee maker or lawn mower? Have the kids been badgering you about getting the latest X-Box game or bicycle that all their friends are riding these days? 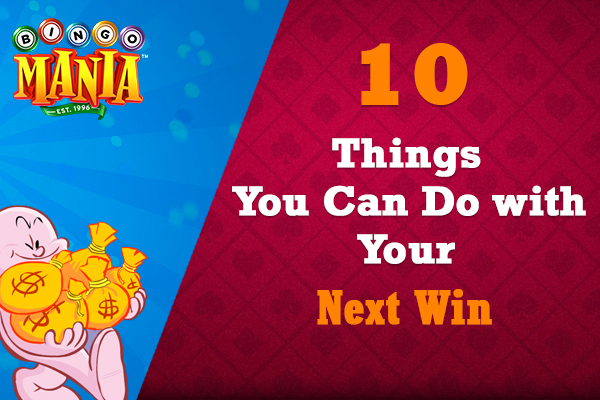 A BingoMania win can be the perfect time to give that ‘just because’ gift and let them share in your latest windfall. Pay off a debt – There is nothing in the world quite like having a zero balance on your credit card, car loan, student loan or mortgage! Even if you only win enough money to make a substantial or even a single payment on any one of these, imagine how good it will feel to have it taken care of. Buy a new car – Maybe it’s time to get rid of the old clunker and get a new set of wheels. It’s entirely possible to win enough money playing bingo online that you can walk into a dealership and pay cash for a new vehicle. Start a college fund – Sending your kids to college or going back to yourself doesn’t have to be a distant dream. You can take your BingoMania winnings and put them into a college fund for your child or even yourself. Do some home remodeling – Maybe it’s time to update your kitchen, bathroom or another part of your home. You could get some new living room or bedroom furniture or finally get rid of those 30-year-old Harvest Gold or Avocado colored appliances and get something new. How about splurging on that reconditioned claw foot bathtub you’ve always been wanting? Your BingoMania winnings can turn your home into your dream home. Make a charitable donation – You could make a donation to your favorite charity to help one of your favorite causes. Whether you are inspired by Public Broadcasting, Doctors Without Borders, or your local animal shelter, giving has its own rewards. The nice thing about this option is that not only do you feel good about it; you get a deduction on your taxes, too. Take that luxury vacation you’ve been promising yourself – Maybe you have wanted to take a break from work, unplug the phone, and go on a cruise. Or you could journey to a far off dream vacation in Europe, an African safari or spend it lying on a beach somewhere in the Bahamas. You can even keep playing BingoMania even while you’re on vacation, too! What will you do with your next BingoMania winnings? Whatever your dream is, share some of your ideas with us in the comments.